I´m working on a project based on some classic fairy tales: this is the first illustration from it, based on Little Red Riding Hood. Like everytime you approach to a new work, the first thing you need to know is what is the subject and what “feeling” you want to give to the piece. 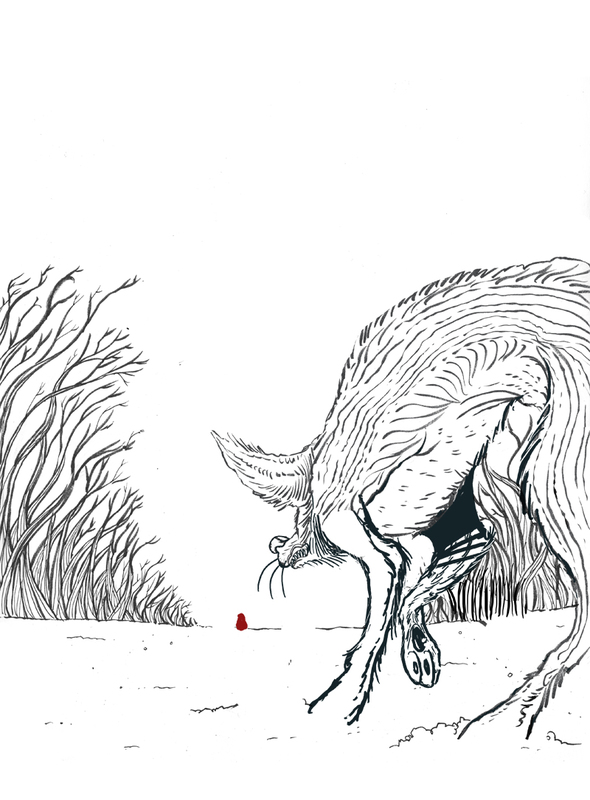 As there are millions of illustrations based on Red Riding Hood, I thought it could be interesting to give the illustration a little more scary and less childish look, a kind of subjective point of view from the wolf. I need a simple an effective composition, where the red color is almost the only color and takes all the attention. The snow helps a lot to get that, as we can leave most of the illustration white an let the red color shine on it. In order to make the red look stronger, we don´t want to use lots of colors so we will play only with the tones of the illustration: a total white is going to be on the ground so we need to put the “heavy mass of color” on the top of the illustration that will go lighter to the total white of the snow. And almost in the center of the composition: our target, the red color. This sketch is going to show us the whole composition and even the color: we don´t need to see the wolf´s hair or details, this is enough to guide us in the creation of the final illustration. One of the most important and dramatic parts of the illustration is wolf´s breath. 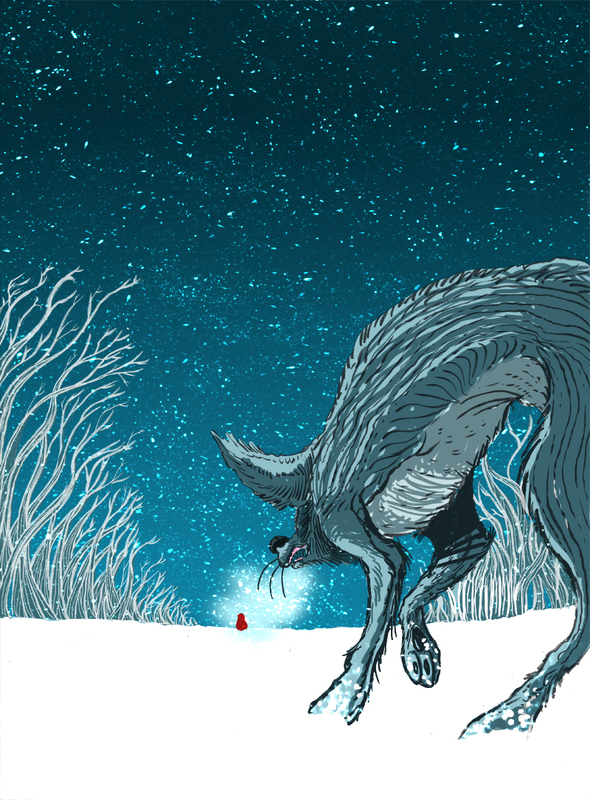 Apart from showing the reader that it is actually very cold, it makes a connection between LRRH and the wolf, that makes him more scary and her more helpless, as it makes the wolf look closer to her and more threatening. Then we go to the line illustration, where we can show all the details. At this part it is very important the use of pictures as visual references: wolves have a very peculiar way of walking, similar to a dog (but not the same). 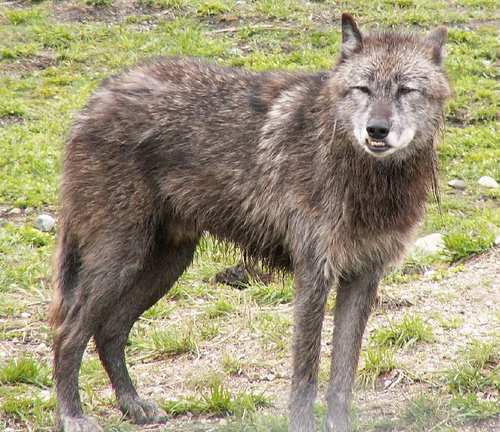 Also their body is narrow and their legs are long and thin: we need to be accurate on those details as we want our wolf to look like a real wolf! 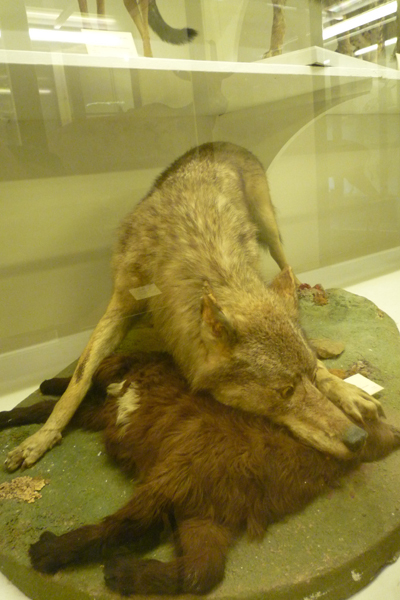 (Note: I took these two last pictures of a wolf at the Specola Museum in Florence: highly recommended if you travel to Italy!). Now we are ready to color it and add textures and details to make the reader feel like he is in the middle of the snow, and also get a stronger image. One interesting detail is LRRH itself: she is just a red spot, with absolutely no detail. 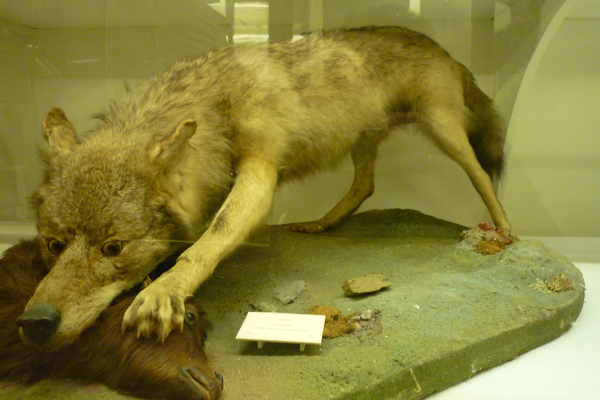 We have a wolf, we have a red spot: we know it´s LRRH, we don´t need nothing else to give us that information. Keep it simple!! 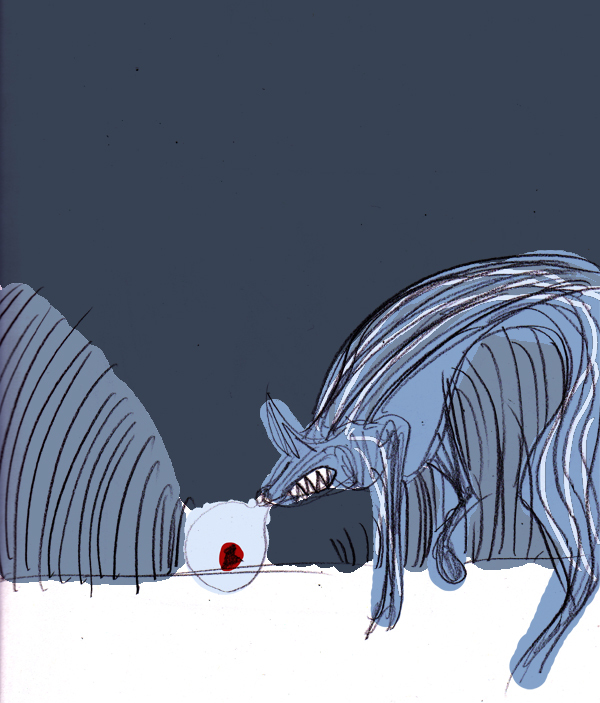 Then just a little pink color for wolf´s gums that connects him with the LRRH red, and takes our eye to his teeth and then to her following his breath. I´ll post more illustration from this commissioned project soon: stay tuned and thanks for reading! !